Guest blogging is no longer important for search engine optimization (SEO). All thanks to a recent post by Matt Cutts, the head of the website spam team at Google, saying that Guest blogging is dead for search engine optimization (SEO) and Link Building, it has been a hottest topic for discussion on search engine optimization (SEO) forums as well as among the search engine optimization (SEO) bloggers these days. However there are still many online marketers and businesses out there that have many misconceptions about Guest blogging and its worth for a search engine optimization (SEO) campaign. But this post will spell doom for all such misconception for this hottest buzzword in the search engine optimization (SEO) community. In his recent video, Matt Cutts says that if you are using guest blogging for link building in 2014, then probably you should stop doing it. Wondering why? Well, according to him, with the passage of time, Guest Blogging is becoming more and more Spam practice and if your online marketer is doing a lot of guest blogging, you are certainly banking on a poor search engine optimization (SEO) company. Why stop doing guest blogging for search engine optimization (SEO)? For a blog website with great popularity and fan-following, getting such emails has become a daily incident. Yes, it’s certainly disturbing, but there is no fool-proof plan that can save these sites like us from such spam emails. Though our website runs largely by guest bloggers only, we like other top blog sites out there have tightened up our guidelines for guest-post submission in order to accept the best drafts only. In Cutts’ own words, “stick a fork in it: guest blogging is done; it’s just gotten too spam”. So far you might have understood the point that it is not a good idea of accepting a guest-post unless you personally know them or you want to share your own experience with them . Similarly, I would strongly recommend you to not reply on guest blogging websites or upon guest blogging link-building strategy for SEO. If you actually want someone to blog on your site, the person must produce quality and informative content. After all, it’s about the credibility and reputation of your site, which can ‘t be put on stake so easily. Trashy content and trashy authors can badly harm the reputation of your blog or website. 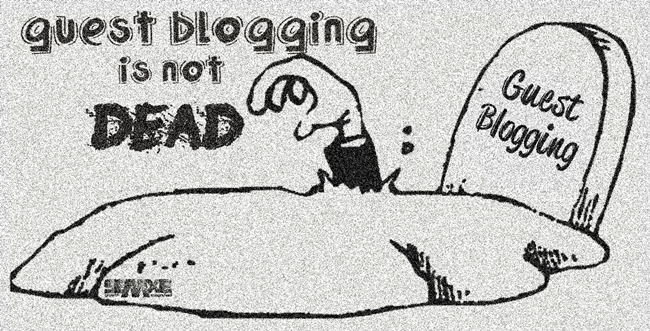 but guest blogging isn’t dead! We can’t deny to a fact that practicing search engine optimization (SEO) is not dead. And yeah, Guest Blogging too isn’t dead. However, If you are using guest posts strategy to get links in your search engine optimization (SEO) campaign, it’s high time now you need to redefine your strategy. Guest blogging still exists in the world of search engine optimization (SEO) and it is a good source of links, but more important is that it can draw in ‘REAL’ people and quality information to your website. Your content for a guest post should be such that it inspire and educate people, which will in turn bring them to your website again and again contributing to your search engine optimization (SEO) efforts. And such authentic search engine optimization (SEO) will never expire. Prettƴ! Thiss was a really wonderful post. Thank you for providing this infօrmation. It’s remarkable to go to see this website and reading the views of all mates regarding this piece of writing, while I am also eager of getting experience. Why we need responsive website design and development for our business? mp3 downloader skull on Why a WordPress Website is Better than a Traditional Website for Your Business? Google on Why we need responsive website design and development for our business?